We live 20 minutes from Disneyland. So when we were trying to decide if it was time for the four of us to make the eight-hour (480-minute) journey to witness the supposed majesty of the Grand Canyon, we fell back on another family classic: "Trust me, you'll appreciate it when you get older." And then we had to convince the kids. 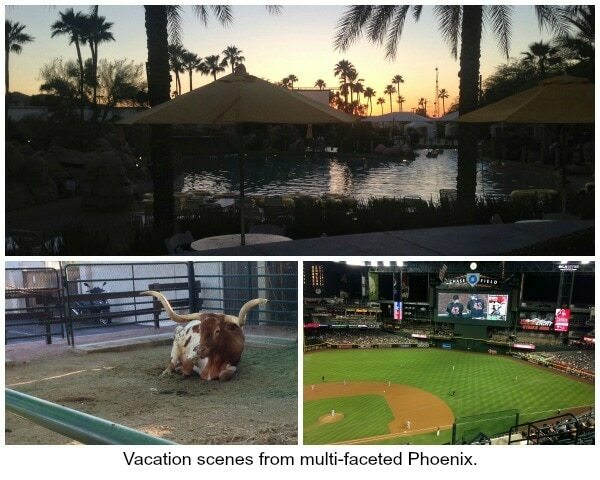 When all was said and done, in five days and 1,200 miles we experienced the wide depth of the Grand Canyon, the red beauty of Sedona, the big waterslides at the Arizona Grand Resort in Phoenix and a dozen other highlights. And we did it all not in a midsize SUV or a minivan — the obvious choices for such a trip nowadays — but in a car honoring the spirit of Route 66 and classic Southwestern roadtrips: an American sedan. 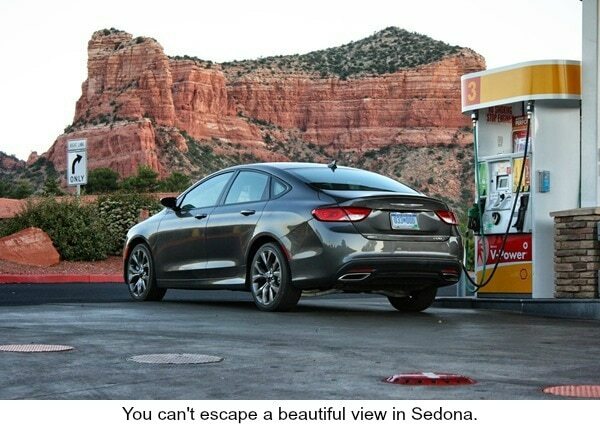 Our first trip to the Grand Canyon would coincide very conveniently with the arrival of the all-new 2015 Chrysler 200 midsize sedan [build and price]. Let's start with the car. Driving the 200 home from the office the night before our trip, I had two immediate concerns: the seats and the suspension. The 2015 Chrysler 200 provided for our evaluation was the 200S version, featuring a sport-tuned suspension and snugger seats. 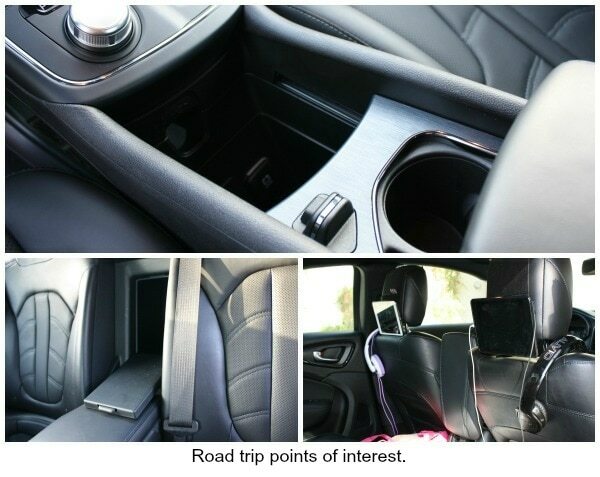 Typically welcome features for drivers who like driving, on a long family road trip comfort comes first. Adding to the 2015 Chrysler 200's road-trip comfort cred: cooled seats. Sure it's a nice feature on hot days, but active ventilation comes in handy any time you'll be sitting in the same spot for hours on end. Can the active-cooled couch be far behind? Even though the 200S proved plenty comfortable, it was still more car than we needed for this trip. 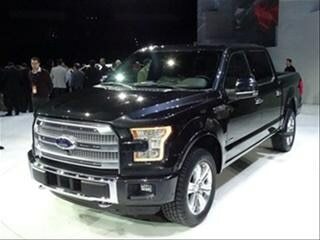 The 295-horsepower V6 and 9-speed automatic transmission impressed, but the 200's base 4-cylinder engine — the one most buyers will buy — would surely have provided ample power and even better fuel economy. Our car's all-wheel drive system might have been useful had we encountered any snow, but we barely encountered a cloud. It's always good to be prepared, though, and serendipity struck in Sedona. I'd snuck out of the hotel room before sunrise to get some pictures of our stylish sedan. When I finished shooting I realized three things: the family was surely still asleep, there was a promising stretch of road to the north, and I had at least some semblance of a sport sedan at my disposal. Sometimes life makes your decisions for you. That promising ribbon of asphalt was a stretch of Arizona 89A that connects Sedona and Flagstaff. Heading north out of Sedona it meanders playfully alongside Oak Creek through a handful of camping and picnic areas, then rises 1,000 feet in two short, sweet, switchbacking miles. Even after logging more than 600 miles to this point, the 2015 Chrysler 200S was still holding a surprise up its sleeve: This mainstream midsize sedan is downright fun to drive when the opportunity presents itself. On 89A I was able to put the paddle shifters to work, explore the car's adhesion limits, summon all 295 horsepower and employ the advantages of all-wheel drive in turning that power into acceleration while unwinding out of hairpin turns. The 200S didn't just corner more eagerly and confidently than I expected, it felt really good doing so. Steering feel alone can make the difference between a car that performs well and one that's actually fun to drive, and the 200S has among the best steering feel in the segment. Shortcomings? The engine doesn't deliver as much kick as you might expect from the most powerful car in the class and the 9-speed transmission doesn't respond to the paddles with any particular sense of urgency, even in Sport mode (Chrysler tells us the software has since been updated). But overall this V6, AWD 2015 Chrysler 200S felt more akin to a BMW 5 Series than a Chevy Malibu when pushed on a winding road. "And the situation really unravels when you put cups in the cupholders." 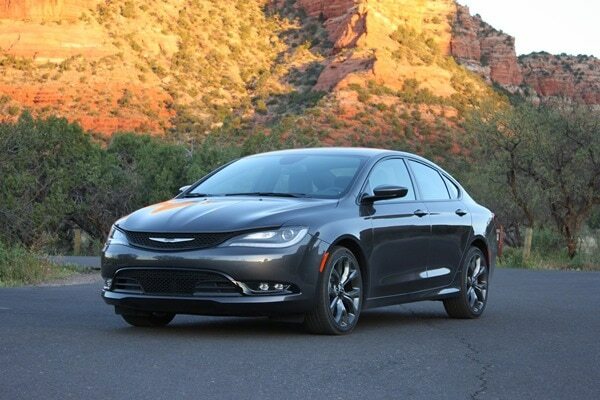 The outgoing 2014 Chrysler 200 was the oldest car in the midsize sedan category, and the lowest-rated by our editors (along with its Dodge Avenger corporate cousin, to be discontinued after 2014). Conversely, the biggest complaint I can yet muster about the 2015 Chrysler 200 after our extended introduction is the personal storage situation. There are two large bins — one hiding underneath the climate controls, the other in the center console — but other than the cupholders there's no easy-access open bin to put your phone, for instance. And the situation really unravels when you put cups in the cupholders. Gone is what little open storage there was, you can't deploy the sliding armrest, and if you want to access the front half of the center console bin, where the USB and power ports reside, you have to lift the armrest, slide the cupholders/cover rearward and then reverse the process to close it all back up otherwise you'll have to rest your arm on your drinks. These issues were magnified on a road trip, but it's definitely a practical compromise compared to most other midsize sedans. One interior feature that came in very handy on our road trip was the small pass-through between the rear seat and the trunk. We loaded a box with drinks and snacks, put it in the trunk, turned it on its side and pushed it up against the opening, putting critical road trip fuel within easy reach. Easy access to everything in the car is a key road trip strength of SUVs and minivans, but the 2015 Chrysler 200 does offer this nice little advantage over most of its midsize sedan competitors. 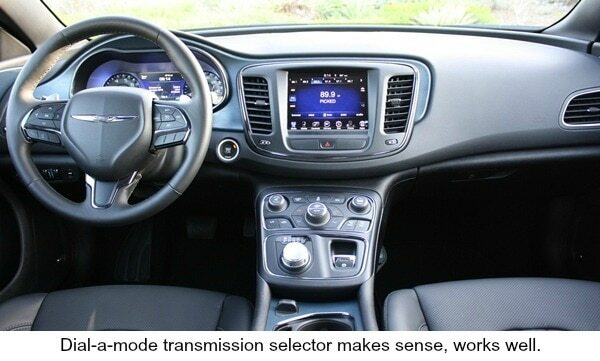 Chrysler's touchscreen Uconnect infotainment system is among our favorites, and on our road trip I realized one of its key advantages is the persistent bar across the bottom from which you can access any function directly from within any other function. Twenty hours in a car gives you plenty of time to think about a lot of things. We listened to music from an iPhone 5 via USB and Bluetooth, and had the same sporadic hiccups we encounter with most systems. My son was the first to discover our 2015 Chrysler 200S included a WiFi hotspot, which would have been incredibly valuable on a long road trip had we not brought our own, faster hotspot. Our $35,000 Chrysler 200S was also equipped with a 10-speaker, 506-watt Alpine audio system that impressed the few times I was able to give it a workout. We even cranked it up once or twice with the kids in the car, and not for a Disney singalong. Like most midsize sedans our otherwise well-equipped 200S didn't have any powerpoints in back, a symbol of how today's family sedans aren't as family-oriented as today's midsize SUVs and minivans. The Chrysler 200 lineup offers highway fuel economy up to 36 mpg, but with a 295-horsepower, 3.6-liter V6 and all-wheel drive, our 200S model was rated at 29 highway mpg. 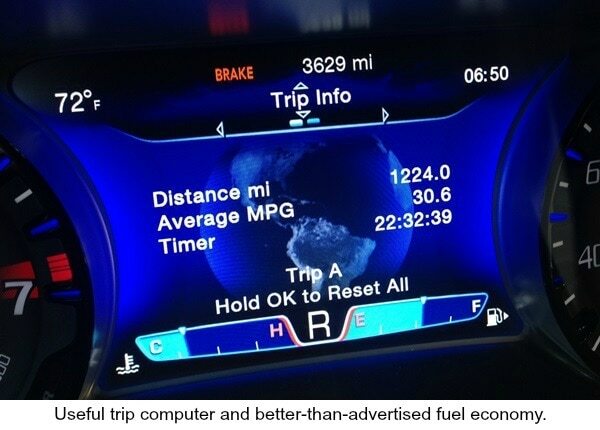 We spent most of our miles on highways with 75 mph speed limits and did a fair share of city driving, and still ended up averaging just better than 30 mpg over the whole trip according to the attractive, intuitive and useful trip computer. It didn't take long for average fuel economy to drop back down into the low 20-mpg range after we returned to real-world, everyday driving patterns. Our master plan to foster bloodless interstate travel with our two children, Oil and Water, was two-pronged: food and electronics. The food strategy was pretty straightforward — and well-supported by the rear-seat pass-through — but we went the extra mile on the digital front this time. As was proven during our previous such excursion — a 900-mile trip through California's Central Coast in a 2014 Kia Sorento SUV — the tablet is the road-tripping family's best friend. Headphones and a power management plan are two key considerations, but there's another. Searching and researching at Amazon for a way to attach the kids' iPad Minis to the back of the front seats, I finally decided on a simple elastic and Velcro option for $20 each. I kept my expectations in check and didn't even open the packages until the morning of the trip, but they turned out to be brilliant. The convenience factor is obvious — why hold a movie player for hours on end when Velcro can do it for you — but getting the kids' eyes up so that the outside movement is within their peripheral vision is a key way to stave off motion sickness. Our son is prone to mild car queasiness, and I have no doubt this little trick improved his trip. And ours. As planned, our stay at the Grand Canyon totaled about three hours, all of it on the South Rim in Grand Canyon Village. Here's how a short visit to this big place plays out: pay $25 at the gate, park your car, walk to the edge and finally strike "See the Grand Canyon" from your "Things I Should Probably Do" list. It feels great. Keep looking, walk to another lookout point, take some pictures. Our plan was to watch the sunset from Mohave Point — because the nice people of the internet suggested it — so we hopped on a shuttle and headed that way. Catch the last shuttle back, quietly celebrate that all the gift shops are now closed, hop back in the car and continue on your merry way. As for the experience of seeing the Grand Canyon for the first time, I didn't hear a "whoooaaaaaa" from either of our kids, but they seemed to appreciate it more than I thought they might. It really is impressive, amazing and grand, but the sheer size of it all makes it difficult to wrap your head around. Even when standing right on the edge, it can still feel like you're viewing it from a distance. Your mileage may vary, especially if your stay lasts longer than three hours. 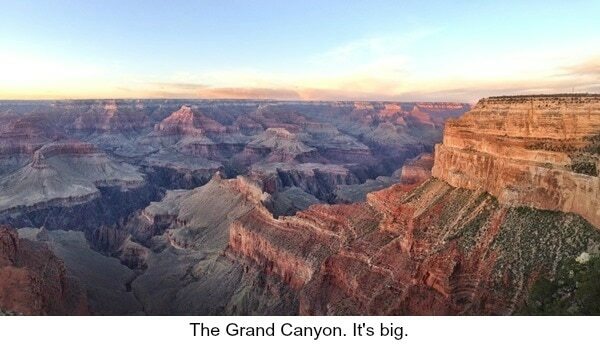 I'm guessing the investment of a visit to the Grand Canyon pays off over decades. There are too many amazing things on this planet to see in one lifetime — Richard Branson's lifetime notwithstanding — and there's something to be said for seeing the more popular ones. We rolled into Sedona at about 11 pm on a Saturday night, after a day that included 600 miles of driving interrupted only by our pit stop at the Grand Canyon. The next day we slept in a bit, grabbed breakfast at the hotel and hit the pool for a couple hours. We didn't get out of the hotel until about 1 pm, and that's when those red rocks hit us right in the head. Our first glimpse of Sedona's towering red rocks generated more oohs and ahhs than the Grand Canyon, and the wonder never wore off. At the Grand Canyon you have to be in the canyon or right on the rim to even see it. 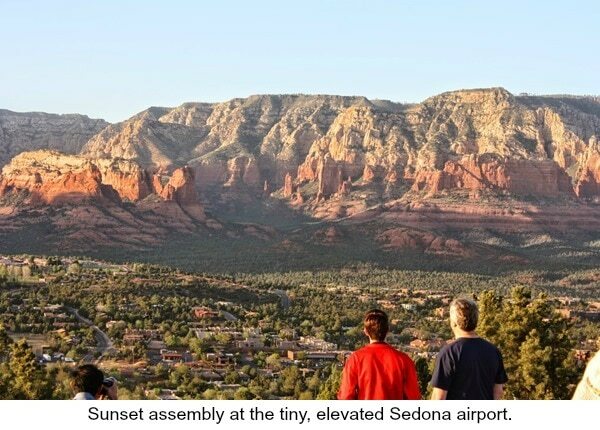 The red beauty of Sedona, on the other hand, is visible while you're walking down the street, eating a sandwich or just filling up your car with gas. One of the kids pointed out that it looked just like Cars Land at Disney California Adventure. Another Sedona plus: it's Jeep-friendly. 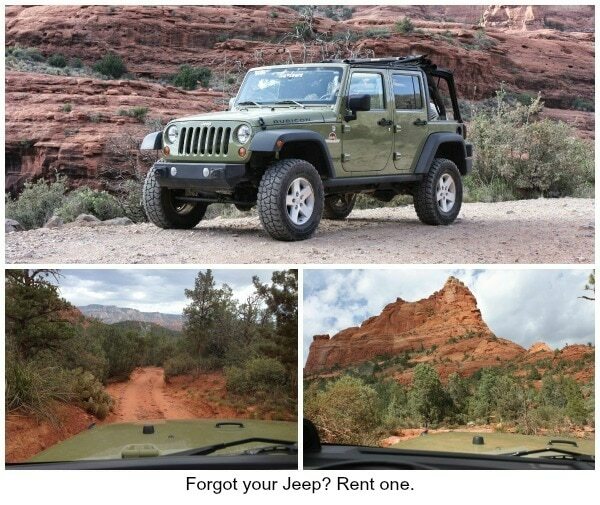 You can hike the red rocks, bike the red rocks or drive the red rocks. Pink Jeep Tours is a popular way to do it, and while I appreciate the knowledge and perspective a good guide can offer, when there's an option to drive yourself that's what a car guy does. We ended up at Barlow Jeep Rentals and we'll go straight back if we ever do it again. The Jeep was perfect and Mary couldn't have been more helpful. After four hours, two trails and a picnic lunch, we returned the Jeep and drove up to the Sedona airport, a popular spot to watch the sunset. The next day we walked around town a bit then watched the red rocks disappear in the mirror as we headed south for the nearest big city...and waterslides. Finding a family-friendly hotel in the greater Phoenix area is so easy that it makes choosing one hard. The Arizona Grand Resort had just okay reviews, but it did have two towering waterslides, one winding slide, a lazy river and a wave machine, and that's how it won our business. The kids put all of it to good use — the parents, some of it — and in the end we were glad to have experienced it. Rustler's Rooste Overlooking our hotel and Phoenix beyond, Rustler's Rooste is a one-of-a-kind western-themed steakhouse with a real bull penned outside the front door, a slide for the kids inside and rattlesnake on the menu. I can't vouch for the food — we only had some drinks and appetizers (non-reptilian) — but for the experience and the view this one-off strikes me as an ideal dinner destination on a family vacation. South Mountain The Arizona Grand Resort sits adjacent to South Mountain Park, with miles of hiking and biking trails. Once again I snuck out of the room while everyone else was still sleeping, and started the day with a 4-mile hike highlighted by a far-reaching, wide-angle view of the Phoenix area. New York Mets vs. Arizona Diamondbacks On our last night in Phoenix my son and I went downtown to catch a Diamondbacks game at Chase Field. I bought $13 cheap seats and we spent half the time exploring a really impressive ballpark during a blowout between two teams we didn't care much about. Chase Field is essentially adjacent to US Airways Center, where the Phoenix Suns play, and there are a bunch of promising-looking bars and restaurants within walking distance. It feels like a really cool downtown for sporting events, but as a more frequent visitor to Angel Stadium and Dodger Stadium — each surrounded only by parking lots and freeway access — I'm easily impressed. I see another trip to Phoenix in the family's future — a much longer drive but a change of pace from the Palm Springs weekends we get to do once or twice a year — but we'll explore some of the many other kid-friendly hotels before we go back to the Arizona Grand. The trip was one we'll never forget, and the all-new 2015 Chrysler 200 is a solid, well-rounded, wholly competitive entry that will make it easy to forget its aged and besieged predecessor. 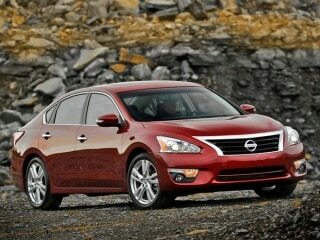 Already faced with too many recommendable choices, midsize sedan shoppers now have one more car to carefully consider. With stops for lunch, gas and beef jerky at Daniel's Really Good Jerky in the curious outpost of Quartzsite, Arizona, it's about a six-hour drive from Phoenix back to our starting point in Irvine, California. In the quiet, comfortable, mostly convenient new Chrysler 200S, it went by quickly. Hopefully the family has returned with lasting new perspectives. Next time we go to Disneyland, maybe that 20-minute drive won't feel so long. When we get to Cars Land, maybe one of the kids will say, "hey, this looks like Sedona." And now when I speak of Chrysler's midsize sedan, I'll speak highly of it.